Additionally, if you have questions about Baduanjin or Zhan Zhuang (Stance Training) in general, there are some great answers HERE from Wong Kiew Kit, the Grandmaster of Shaolin Wahnam Kungfu. 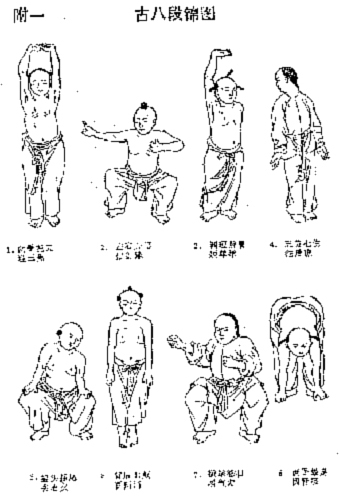 In the Ba Duan Jin quote, exercise "b" is missing, so you posted seven exercises and not eight. That is a little confusing. Right. But since you wondered about the accuracy of that wiki statement, and I had that book laying around, and a few minutes to type stuff up...well, there it is.